Women are different from men. From bike fit to nutrition to aging patterns, women ride differently. 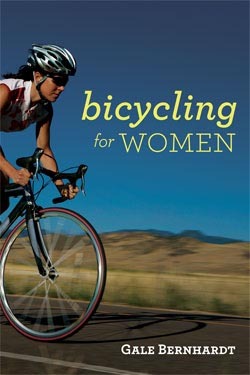 Most serious cycling books fail to address the specific concerns women have about cycling. In Bicycling for Women, cycling authority Gale Bernhardt discusses all things female for women who love to ride. Bicycling for Women is up-to-date, smart, and clear. Gale addresses basic questions on bike fit, equipment, and training before moving on to more complex issues like cycling and pregnancy, injury prevention, nutrition and diet plans, and making cycling more comfortable. The book features five detailed training plans to help women meet their cycling goals, including 50-mile and century rides, improved hill climbing, and multiday bike tours. Encouraging for newcomers and invigorating for experienced cyclists, Bicycling for Women is an essential resource for women who love to ride. Gale Bernhardt has coached and instructed athletes since 1974, and was selected to be the USA Triathlon team coach at the 2004 Olympic Games. An elite-certified USA Cycling Level I Coach, she has also served as the Chairperson of the USA Triathlon National Coaching Committee for five years. Bernhardt has traveled the world as a USA Triathlon World Cup coach. Bernhardt is the best-selling author of Training Plans for Multisport Athletes, Triathlon Training Basics, and Workouts in a Binder(r): Swim Workouts for Triathletes. Paperback. Illustrations, charts, tables throughout. VeloPress is an endurance sports and fitness publisher focusing on the sports of cycling, triathlon, and running. VeloPress training books help both serious athletes and beginners build skills and fitness. VeloPress is the book publishing division of Competitor Group, Inc., publisher of VeloNews, Triathlete, Inside Triathlon, and Competitor magazines; and producer of Elite Racing marathons and half-marathons and the Muddy Buddy adventure series.